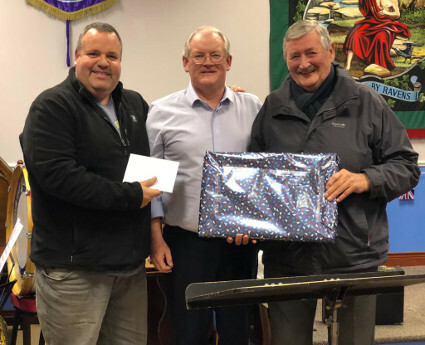 After 20 years of dedicated service to the band, Jimmy Hunter - 2nd trombone stalwart has decided the time was right for him to take things easier and has decided to retire from playing. Over his 20 year tenure Jimmy enjoyed many winning contest performances and subsequent celebratory parties. Two of his biggest highlights were being part of the band's first CD recording "On The Castle Green" and representing Northern Ireland at the European Brass Band Championships which were held in Groningen, Holland. The band will miss his happy demeanour and sense of fun in the rehearsal room while always giving his all to provide the best performance. 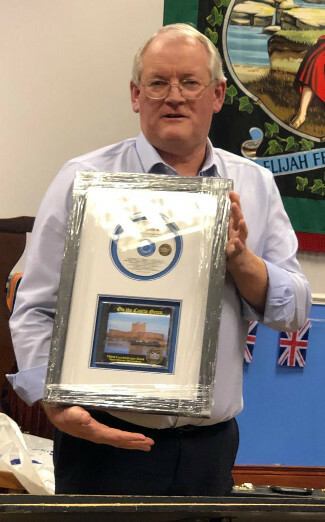 The band presented Jimmy with a beautiful framed copy of "On The Castle Green" as a memento and wish him a long and happy retirement.